Borrow a bell - Make some noise! Grab a bell at the top or bottom of the trail. Attach it to your ride! It helps to alert others as you approach. By PayPal or credit card. Thank you! Use a bell - Help open new trails! purchasing bells or starting a program. Montaña De Oro (MdO) State Park, to help address the issues surfacing because of greatly increased trail use. Trails at MdO have always been very popular multi-use trails with equestrians, hikers, trail runners and cyclists. As these trails became more popular, CCCMB decided to become pro-active in addressing the growing potential for trail conflict. In order to protect open trails from closure and to encourage land managers to approve the creation of new mountain biking trails in the region, the Bells4Bikes Program was born. CCCMB soon expanded its bell program to include San Luis Obispo City multi-use trails for the same reason. Both State Parks and SLO City are very supportive of the bell program. We believe that if equestrians and hikers can hear approaching mountain bikers, there would be more time for all trail users to meet safely. 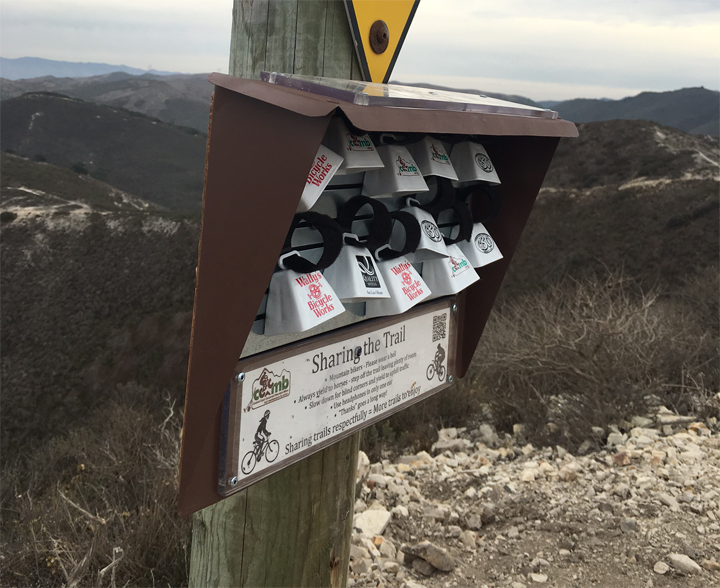 Subsequently, CCCMB built and installed Bell Boxes at the trailheads and tops of select trails at Montaña de Oro State Park and in a half-dozen sites in the San Luis Obispo Open Spaces. These trails were selected with an eye for their high conflict potential, as well as the receptivity of the local land managers. The boxes were stocked with size #00 cowbells embossed with the CCCMB logo and included a velcro strap. Subsequent donations from community bike shops and trail user groups permitted us to create donor-labelled batches of bells for distribution and passive advertisement for our supporters. The Bell Box placards encourage riders to borrow a bell and attach it to their bike. We ask that the bells be returned to the Bell Box at the bottom of the trail or be kept for use on subsequent rides with a donation of $4 (see left column), or via the QR Code on each bell box. Feedback received from local hikers and equestrians has been very positive and supportive of this program. Generally speaking, humans hear the bells a few hundred yards away; horses can hear them from a distance of a 1/4 mile or more. The Bell Box Program has raised the awareness of all trail users and resulted in improved, courteous interaction between local trail users. CCCMB feels that this has helped maintain trail access in locally notorious areas of traffic. Most importantly, the receptivity of local land managers to the Bell Box Program has allowed us to open more trails to mountain bikes and multi-use in the county and assured us that they will stay open to bicyclists as our trail system expands!